Student enrollment increased 7 percent at Tarleton State University in the fall of 2014 with a new student body eager to contribute. Tarleton is known for its student engagement on campus and with the student body increasing now is the perfect opportunity to grow more than one way. According to the Strategic Enrollment Management Executive Council, the criteria to be accepted to Tarleton have been raised. So not only did enrollment jump but with excellence. This semester organizations have begun to see great change within themselves due to this year’s flood of talented students. 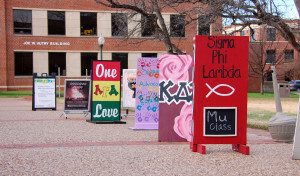 Organizations such as PanHellenic (sorority), IFC (fraternity), SWAT, RL & TTM, PANKUS, Plowboys, Texan Reps, club sports and Student Government Association have benefitted from the growth with new students bringing fresh ideas, talent and spirit. Not only are current organizations expanding, but new ones also are getting started and future ones are being planned. 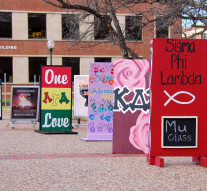 Sandwich boards outside of the library and dining hall advertise for different organizations around campus. This year’s group of recruits are more focused not only about raising spirit of students but also on their grades and new ideas for P.A.N.K.U.S. They “make good candidates to take over,” Guinyard added. Another spirit organization, the Plowboys, had an exceptional turn out in the fall. “This year’s recruitment was much higher in numbers,” said Justin Wolff, president of Plowboys. Last year, the number of recruits dwindled and number of active members fell, due to members graduating and other reasons. Due to the boost in recruits, IFC has brought to Tarleton a new fraternity looking to colonize, Phi Kappa Sigma recruiting spring of 2015. Panhellenic, too, is hoping to bring in another sorority as they are “undergoing extension and hope to see a new sorority fall 2015,” said Tiffany Camargo, Delta Zeta member and Panhellenic delegate. 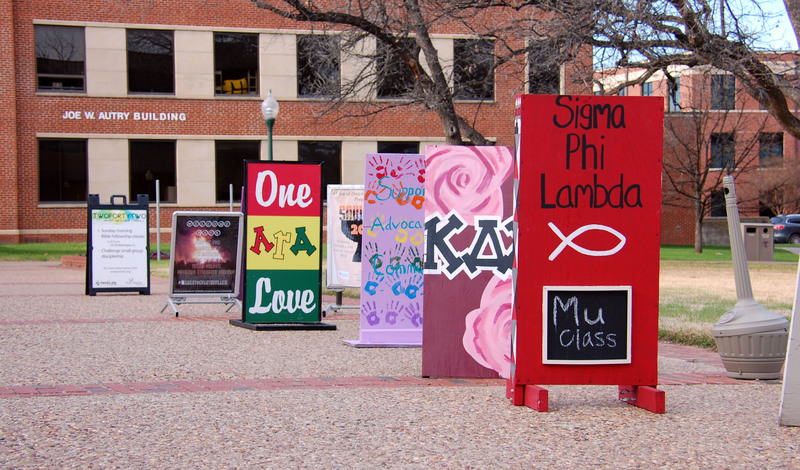 “Another sorority will only increase our Greek life at Tarleton and better us,” Camargo said. In the fall, organizations noticed a bump in recruitment, and they are going to take it and run with it and continue to improve. The higher number of students getting involved was not due to the fact of enrolling so many students, but because of the type of students Tarleton enrolled. The council focuses on bringing in students that show core values: integrity, leadership, tradition, civility, excellence, and service. By Tarleton getting these students, Tarleton’s “criteria for admission of first-time in college freshmen are changing to progressively higher qualifications,” according to The Strategic Enrollment Plan. Even though the admission criteria are higher, Tarleton is bringing in more and more freshmen every year, a 7.7 percent increase, according to the Strategic Enrollment Plan. Since these requirements have been put in place it has allowed a more talented and outgoing class to attend Tarleton State University, which pushes growth in programs and student engagement.